Home / February – the perfect month to pop the question! 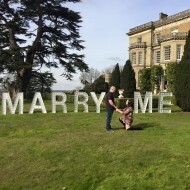 None of them beat this one though……a leap year proposal from last year…….what better way to propose than to spell out ‘MARRY ME’ in our 5 foot light up letters! (Oh…..and we are pleased to report he said yes!). It’s really interesting that proposal planners, as well as wedding planners, are now big news. Clearly, things have moved on a lot from the traditional diamond ring in a box over a candlelit meal. We would love to hear from you if you want to show your love in lights as we still have some winter discounts running – please ask for details.